The artwork for Cheech and Chong's Hey Watch This (live tour) DVD & Blu-ray has been revealed. The Cheech & Chong: Light Up America and Canada tour, where Cheech and Chong performed together for the first time in over 25 years, is now on DVD and Blu-ray. The pop culture duo performed for more than 100 audiences and quickly became one of the most sought after shows of 2008-2009. Their performances in San Antonio, Texas were filmed by the Weinstein Company. This DVD contains the entire performance, as well as behind the scenes and other funny features. The DVD and Blu-ray will be released April 20th (420!). We have a special pre-order. Reserve yours today. The Cheech & Chong: Get It Legal tour has added three new dates. Click on the ticket link above. On Sale: February 24, 10AM local time. On Sale: February 25, 10AM local time. While you're at it, be sure to pre-order their live concert DVD, Hey Watch This. It will be released April 20th (420!). Cheech Marin, Tommy Chong and a host of other celebrities are providing voices for Hoodwinked Too! Hood VS. Evil. Cheech Marin is Mad Hog and Tommy Chong is Stone of The Three Little Hench Pigs. This Weinstein Company film will be released in 2010. According to wikipedia, "Burger King released Kid's Meal toys based on the film in early January 2010, even though the film had no release date. Apparently The Weinstein Company sold the promotional rights to Burger King promising a January release date and Burger King went through with the promotion even though the film was no longer being released in January 2010. No matter what the reason it is clear the Burger King promotion will not benefit the theatrical release since it will be long over before the film is released, should it see a theatrical release and not go direct-to-DVD like so many other Weinstein Company films due to their financial problems." Former US District Attorney, Mary Beth Buchanan (or Mary Beth Loose Cannon as Tommy Chong calls her), is running for Congress. She says "I am running for Congress because Washington needs a new direction." This is the same Mary Beth Buchanan that wrongfully sent Tommy Chong to prison for nine months for conspiracy to send bongs in the mail. Chronicles of the Nerds interviewed Cheech and Chong about their upcoming animated film, their live DVD and Up in Smoke 2. They jokingly say the title of the new film is "Avatar 2: Escape From Guantanamo." Just announced. The Cheech & Chong: Get It Legal tour is coming to the Morris Performing Arts Center in South Bend, Indiana April 11th. Tickets go on sale Friday February 19 at 4:20PM local time via this link. Big Vision Entertainment, a leading independent licensee, producer and DVD label for special interest programming and Chambers Bros. Entertainment a television and animation have posted the trailer for the Cheech & Chong animated film. It's part of an exclusive deal with music mogul Lou Adler, owner of Ode Records, for the animated movie rights to the classic Cheech and Chong library of recorded comedy content. 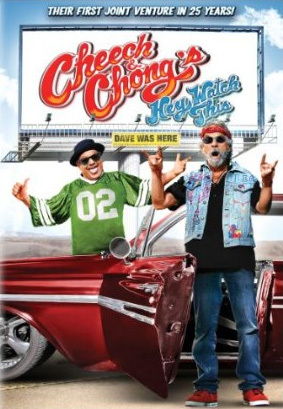 Richard "Cheech" Marin and Tommy Chong were each paid $500,000 cash to use their likeness. Eric & Branden Chambers are directing the animation. Project is produced by Houston Curtis of Big Vision, along with Keith, Branden and Eric Chambers of Chambers Bros. Entertainment, who created the concept. In addition, Adler, Curtis and the Chambers Bros. served as executive producers. Project was completely financed by Big Vision Entertainment. Sales for DVD, digital and television will be handled through Big Vision's TV and home video arm, which currently has distribution for over 100 titles throughout the US and around the world. Official animated film web site. If you haven't done so already, pick up Cheech & Chong's Hey Watch This live concert DVD. It's being released April 20th, but is available for pre-order. The Cheech & Chong: Light Up America and Canada tour, where Cheech and Chong performed together for the first time in over 25 years, is now on DVD. The pop culture duo performed for more than 100 audiences and quickly became one of the most sought after shows of 2008-2009. The DVD will be released April 20th (420!). Watch the live video streaming of George Lopez' celeb-filled event tonight at 7:30 pm Pacific Time. George's guests include Slash, Samuel L. Jackson, Andy Garcia, Kobe Bryant, Ray Romano, Larry David, Vanessa Hudgens, Cheech & Chong, Don Cheadle, Eva Longoria Parker, Magic Johnson, Charlie Wilson, Margaret Cho, Cedric the Entertainer, Cypress Hill, Sly Stone, Los Lobos, Won-G, Amber Valetta and Jennifer Love Hewitt. If you're having problems viewing, click here. This Thursday, George Lopez will be holding a benefit for CARE's charity efforts for Haiti. George Lopez is headlining. Also appearing will be Cedric the Entertainer, Kobe Bryant, Larry David, Magic Johnson, Slash, Ray Romano, Vanessa Hudgens, Don Cheadle and more. Where: Nokia Theatre, Los Angeles.